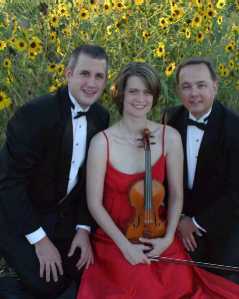 Formed in 2002, the Sunflower Trio is dedicated to the performance of music featuring voice, violin and piano/organ. Consisting of Rebecca Schloneger, violin, Matthew Schloneger, tenor, and Kenneth Rodgers, piano and organ, the trio excels in a variety of styles, from Baroque to contemporary, folk and Broadway. Educational residencies are available. Our new release, "Reflections: The Music of J. Harold Moyer" is now available for purchase.